One evening Amanda Montgomery sat overlooking her front yard. Like every gardener with a wandering eye, she began to reimagine the grass-filled space located on Richmond’s Southside. Now more than two years later, her half acre lot is home to Hummingbird Gardens, a neighborhood market garden that sells herbs and fresh flowers to local businesses and consumers. With a master’s degree in food studies from Chatham University and experience working on a farm, Montgomery began planning what Hummingbird Gardens would become. She looked for opportunities to complement Richmond’s robust farming community and found her niche in exotic, hard-to-find herbs. PERK! Coffee and Lunchbox in Bon Air, the company’s first business customer, purchased Hummingbird Gardens’ tarragon for a popular cherry tarragon relish that is part of restaurant’s house greek yogurt. But Montgomery persevered. Soon, Savory Grain signed on and then Jessica Bufford with Toast, Hutch and Talley’s also enrolled in Hummingbird Garden’s Garden Share. Through the program, Hummingbird Gardens drops off fresh herbs for 20 weeks for restaurants to use in food and cocktail programs. Montgomery also provides flower arrangements and buckets for some businesses as well. “When Jessica said, ‘Yeah, we’ll sign on all three restaurants,’ I got that email and cried because I thought, ‘Ok, I can do this,” said Montgomery. Leslie Knope, Trudy and Sergeant Pepper hangout at back – Montgomery’s Barred Plymouth Rock chickens – producing about one egg each, per day. Across the yard, a beehive brims with honey bees. 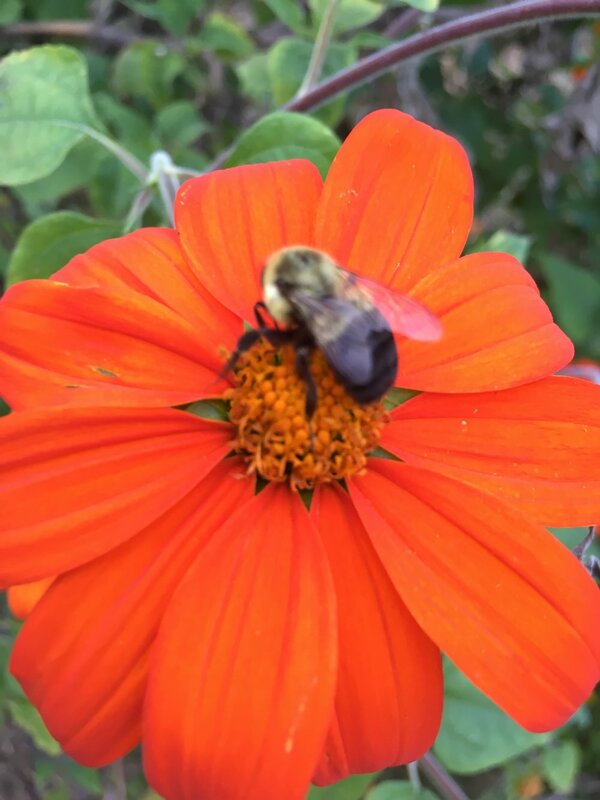 Honey bees can travel two miles or more in search of pollen but at Hummingbird Gardens it’s a short trip. Montgomery’s 2016 Christmas present sits in the backyard too: a greenhouse that allows her to start seeds well before the last frost date. Last year, Hummingbird Garden began selling flavored salts, which turned out to be a natural progression for the business. 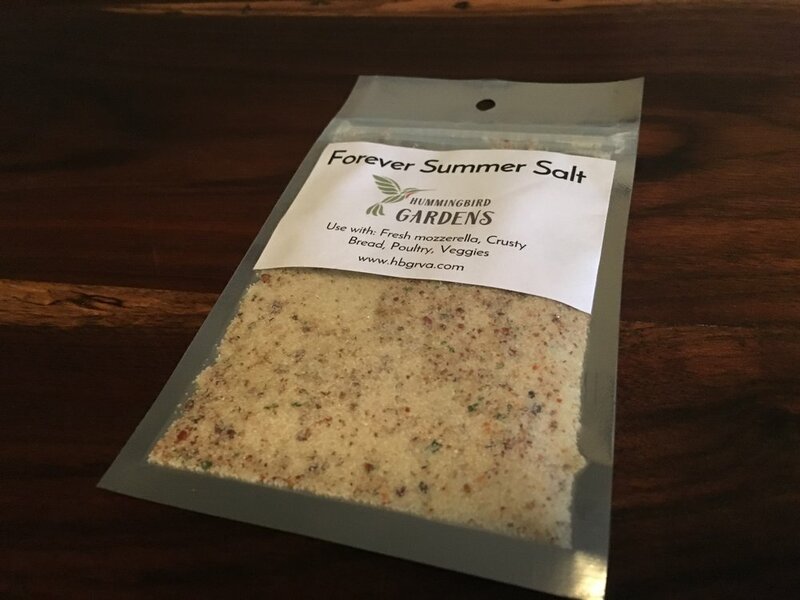 Six salt flavors are currently available through Hummingbird Gardens’ website and at local stores like the Olive Oil Taproom and the Little House Green Grocery, including rose chile, lemon basil, rosemary thyme, thai basil, garlic chive and the newest, “Forever Summer” which features dehydrated ripe tomatoes and sweet basil. Montgomery loves collaborating with other growers and small businesses. Her consumer-facing version of Garden Share includes weekly flower arrangements and herbs, along with items from other local makers such as Nightengale ice cream sandwiches or Mavenmade all-natural wellness products. Soon she’ll begin offering dried flowers too – arrangements currently hang inside her house, next to marigold and sunflower seeds she’ll sell to gardeners in the spring. Nearby, a stack of eccentric vases sit, a gift from Montgomery’s late grandmother. Montgomery credits Hummingbird Gardens for pushing her to get out in the front yard and meet new neighbors. Runners, walkers and cyclists often stop to admire the plants, something Montgomery encourages. A yard overflowing with flowers is a great conversation starter, after all. She hopes the garden inspires others too. To learn more about Hummingbird Gardens, visit www.hbgrva.com. For market and sale updates (and a lot of lovely flower photos), follow the company on Instagram at @HummingbirdGardensRVA. A "herb spiral" Montgomery constructed.